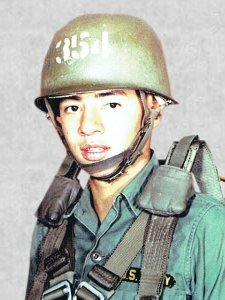 Alfred enlisted before graduation and was killed in action in Viet Nam on February 7, 1968. While at Bowen, he was a member of the ROTC. At the end of his junior year, he enlisted in the United States Army. At the time of his death he was a paratrooper with the 101st. Air Borne Division. He had been in Viet Name for six weeks. Alfred in Paratrooper gear. His medals. Alfred died as a young hero. He was the first Vietnam casualty our class lost, I believe. I still think of him. Memory eternal. His brother Art, emailed me 15 years ago and we stayed in-touch for a short time. I wonder if the plaque & flagpole that was put up for Alfred is still there? Unfortunately the past is too quickly forgotten and erased from existance. Long ago the memory of Alfred and the symbols the class erected disappeared. However, like many true events that need to remembered, we who knew Alfred, especially those who shared some of his experiences, will never forget. Fortunately there is a wall nearby the Lincoln Memorial that commits his name to memory for all time.